Of the two large sugarberries (a.k.a. southern hackberry) near the Community Partnership House, this one on the west side is the tallest, topping out at 29 m (95 ft.). As you look up the trunk of this tree, admire the smooth bark, interrupted only occasionally by warty lumps. Beeches are the only trees native to this area that have smoother bark. 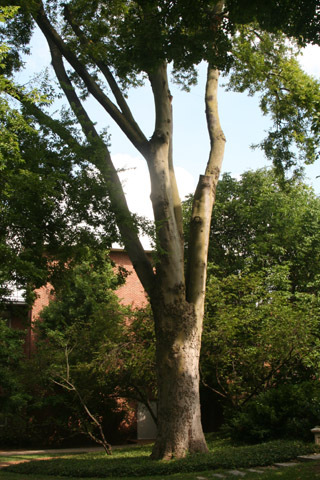 However, this trait is very variable in hackberries, as you can see on the lower part of the trunk of the tree on the other side of the Community Partnership House. This organism is a living specimen that is part of the  Vanderbilt University Arboretum  with the local identifier 4-855.